Dang those Mayans! We were all ready to rake in the cash at the end of the world in Dec. 2012, but nooooo. The earth just had to keep on spinning. Now we're stuck with 9,997 awesome backpacks, chock full of gamer/survival gear. So we've priced them to MOVE! That's right, pilgrims, your old saddle pals from Hawgleg Publishing have created the must-have product of the season… well, of last season, anyway. 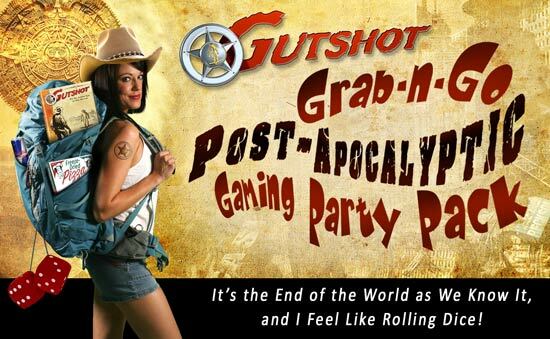 The Gutshot Grab-n-Go Post-Apocalyptic Gaming Party Pack is THE dream product for gaming survivalists (or should that be "survivalist gamers?"). 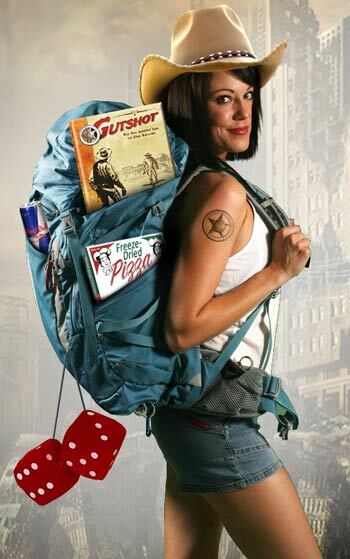 The fact is, we created a truck-load full of gaming-themed survival backpacks and were all ready to sell them when the world came to an end. But of course, it didn't. "At least we're pretty sure it didn't – turning on the evening news sometimes makes us wonder," said Gutshot co-creator Mike Mitchell. The pack contains vital gear that you will need to survive in the dark days ahead following the collapse of civilization as we know it… or at the very least to make it through your family's next road trip to Wall, South Dakota with your sanity intact. A copy of the Gutshot Core Rule Book (hey, if you're only going to have one set of rules to entertain yourself with in the rubble-strewn landscape of a dystopian tomorrow, shouldn't it be an Origins Award winner?). 100 lead cowboy miniatures (standard 28.67 mm size; the game plays great with about a dozen, so you can melt down the rest to make bullets or – if you're living near Chernobyl, use them to create some lead-lined underwear). Ring-mail dice bag (because a purple-felt Crown Royal bag just won't hold up) with 100 six-siders (Gutshot only needs 2d6, so you can always use the extras as emergency ammo for your slingshot). A pre-printed town of Whitewash City Paper Buildings (pre-cut with sticky tabs so you can put them together and break them down again and again as you move from camp to camp, grubbing for sustenance and avoiding punk rock slavers humming Tina Turner songs). Freeze-Dried Pizza (a gamer's gotta eat). Freeze-Dried Red Bull (a gamer's gotta drink… and stay alert when he's hiding from Mad Max-style cannibals). Freeze-Dried Turkey Jerky (actually, we're not quite sure why they had to freeze dry this one). Toilet Paper (you know why). 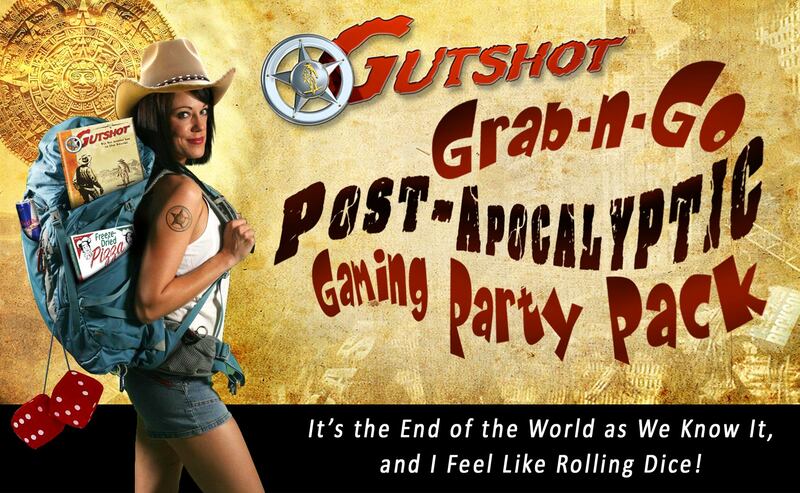 A bonus pack of Gutshot character sheets (for when the toilet paper runs out – we suggest using them after the game). A sleeping bag for one (because we know gamer's don't have girlfriends). A 10-foot pole (just in case you have to go into a dungeon). BTW: Paul "Mad Dog" Mauer wanted to add that he has seven potions of Sweet Water for sale and that you can find him in a shadowy corner of your neighborhood adventurers tavern. That's right, pilgrim. Last year our saddle pal Paul "Mad Dog" Mauer got it into his head that the whole world was gonna go ka-blewie in December on the solstice because of that old Mayan prophecy. He was so convinced that he even tried to sell off his prized collection of Star Trek pizza cutters (including the limited edition, gold-plated one signed by Will Wheaton). Calmer heads prevailed, though, and Mitchell and Murphy were able to convince him that, even in a post-apocalyptic wasteland, someone would figure out a way to make a peperoni pizza – even they had to use freeze-dried irradiated goat cheese to do it. "And that got us thinking even more," Mitchell said. "I mean, if someone was going to profit from the disaster… er, um… I mean help people make it through the troubling times ahead, why not let it be us?" But even though the Hawgleg boys were concerned for the future, they weren't ready to panic. Not when there was a profit to be made (and heck, if things got really bad, the trio figured they could always hang out in Murphy's Bongolesian Summer Palace until the worst of it blew over). Hawgleg Publishing co-creator Mike Murphy was less sanguine about the matter. Smoking a hookah in the command yurt he keeps near his Civil War Re-enactment camp in Indiana, he waxed philosophical about the continuation of our modern times and the company's proposed profiteering. "Yes, we were planning to profit off the destruction of the world," Murphy said, smoke rings rising above his head in the languid breeze. "And we're okay with that. We were going to sell a quality product to a demographic traditionally underrepresented in most post-apocalyptic futures: The Gamer Geek. "After another thoughtful puff, he added, "Come on, it's not like we were going to try slipping in gluten-free pizza or something gross like that. This pack includes high-quality components that would serve anyone in any type of crisis. Except, of course, Cthulhu coming back. I mean, nothing would help you then." Muttering again about how, "the stars aren't right… yet…" he allowed the dreamscape to take him once more to the ice plains of distant Kadath and let the visions claim him. With Murphy exploring the midnight shores of distant Carcosa, that left Mitchell and Mauer to focus on the details of tracking down their partner's old contacts in the former Soviet military so they could cobble together enough Cold War Era surplus to create the Gutshot Grab-n-Go Post-Apocalyptic Gaming Party Pack, or the G4P2 as Paul would come to call it. "All you need to do is say the full name two or three times and you realize that it needs an acronym," Paul said. "And an acronym that sounds like it could be a droid from a Star Wars sequel is even cooler." Although created for the end of the world, the packs provide everything you will need to face any type of disaster… or LARP. Which is why Hawgleg is proud to offer these life-saving essentials to the public at cut-rate costs. "We discussed whether or not we should prep the pack for a specific type of apocalypse (economic, bird flu pandemic, asteroid impact, time-traveling Borg Assimilation, zombies, or yet another Kardashian Reality TV Show)," Mitchell said. "But we decided against it and just kept things generic." The packs are made of high quality, triple Nylon flexi-weave, Kevlar fabric with loop-back stitching on the straps and Corinthian leather fittings on an adamantium frame (that also doubles as a toboggan) . Although it's not actually magical, it actually seems larger on the inside than the outside (making it ideal for a Doctor Who LARP), making it possible to fit all the contents listed above, along with a Ming Dynasty tea set and two DVD Box sets (not included). Also, due to Federal Regulations, we cannot include the requisite firearms or guns that one would normally expect to need at the end of the world. But since that didn't happen and this is now just for gaming enthusiasts, that's probably for the best. "The last thing any of us need is a rules lawyer packing heat," Mitchell said. The entire pack is available for only $2012.12 (payment preferred in gold coins or vintage Archie Comics). Additional shipping and handling charges (including, possibly, a full-body massage for Murphy) may also be required to ensure that the G4P2 arrives in time for the start of the next millennium. That is to say, it will never arrive because, once again, this is another beer-fueled April Fool's Day story by grown men who should know better, but obviously don't. Have a great one, folks!